This course is designed to fly safe at most established flying sites around the world. 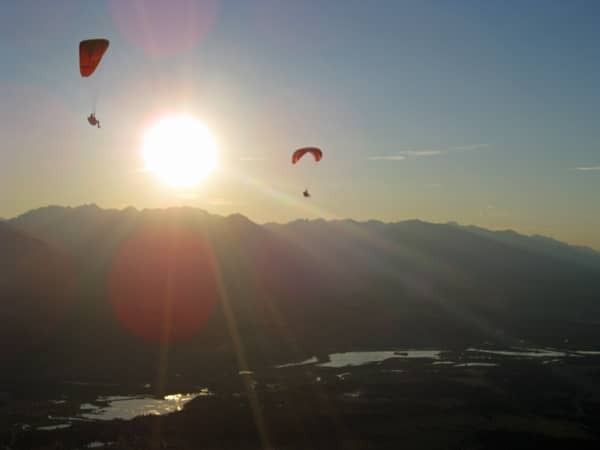 This P2 course will focus on perfecting your launching & landing techniques (foot and ski), canopy control, thermaling, ridge soaring and XC flying. This course will include a minimum of 6 hours in classroom lectures in Risk Management, how to recover a paraglider to normal flight from unexpected situation and reviewing Aerodynamics, Meteorology, Air Regulations, Risk Management. *This includes the P2 Novice HPAC written exam. The Practical lessons include ground handling, foot and/or winch launch, landing approaches and air work. To obtain the P2 rating, you need to have a minimum of 25 high mountain flights or 35 towed supervised flights. We continue to update our calendar if we add new or additional courses during the year. Please contact us if you have a specific date that would work for you, or if you would like to book a private or private group lesson.